The 2013 NSRA Quality Aircraft Care Sand Drag Series wrapped up the 2013 sand drag racing season at the SCSDA's Soboba Casino Season Finals event in San Jacinto, CA. This race saw some incredible racing from start to finish with championships on the line. Click the link below to check out the points document for the final standings on the 2013 NSRA season. Atoka Motorsports Park in Atoka, OK hosted their Annual Fall Fest event in Mid-October. This race was the final point series race for Atoka Motorsports Park’s track championships as well as the Season Finale for the Mid-America Sand Drag Series. This led to some intense racing action across the board with racers from across the region and beyond converging on the Southeastern Oklahoma race track. 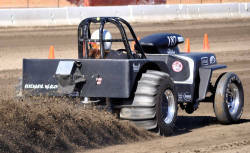 The Southern California Sand Drag Association (SCSDA) held their “Racin’ For A Cure” event in early October at the Soboba Casino in San Jacinto, CA. NSDN was on hand and took some great photos from this event. Click “Read More” to view the event photo gallery. Avenal Sand Drags in Avenal, CA has released their 2014 race schedule. These events will be held on April 26-27 and October 18-19. The Avenal crew is planning some major improvements for the 2014 season, which will only make for even better racing at this great Central California track. Stay tuned to this site and www.AvenalSandDrags.com for more details. SCSDA will be holding the “Season Finals” event on November 15-17 at the Soboba Casino in San Jacinto, CA. This event will be the final race of the season in both the NSRA & SCSDA point’s series. Read on for full race info. The 2013 Mid-America Sand Drag Series came to an exciting conclusion in early October at Atoka Motorsports Park in Atoka, OK. A great turnout with racers from as far away as Michigan came out to support this Oklahoma event. MASD Series champions were crowned as Rod Trower (Top Alcohol), Terry Glasscock (Top Eliminator), Tim Feuerhelm (Pro 1 Cars), and Randy Kimbley (Pro 1 Quads) took home top honors. Click the link below for full early season MASD point series info.